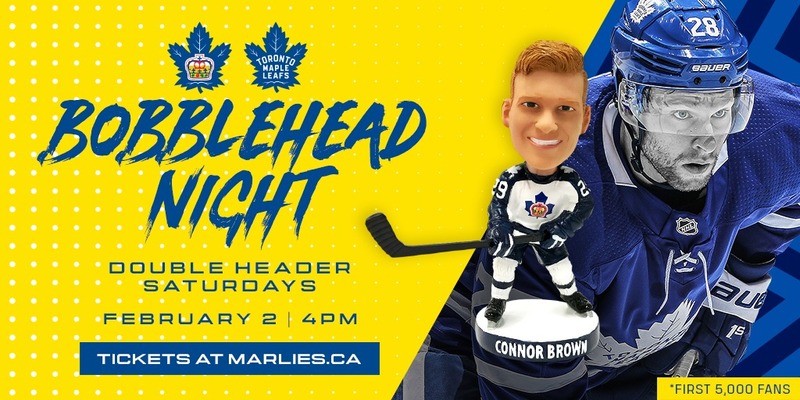 The Toronto Marlies have announced that their first bobblehead giveaway game this season will feature 2016 Marlies Graduate, Connor Brown. On February 2, the first 5,000 fans in attendance at Coca-Cola Coliseum will receive an exclusive Connor Brown bobblehead to kick off a Doubleheader Saturday. Marlies Doubleheader Saturday’s are celebrations of hockey in Toronto where the Marlies play at home in the afternoon and the Maple Leafs play at home in the evening. In addition to the bobblehead giveaway, fans in attendance will have the opportunity to win great Marlies and Maple Leafs prizes, including tickets to Maple Leafs games. The Marlies will host the Laval Rocket for a 4:00 PM puck drop at Coca-Cola Coliseum. Fans can reserve their seats now by purchasing tickets online through Ticketmaster. Prior to joining the Toronto Maple Leafs organization, Brown had an impressive Major-Junior career captaining the 2012-13 and 2013-14 Erie Otters of the Ontario Hockey League where he played alongside Connor McDavid. Brown had a career year during the 2013-14 season, tallying 128 points in 68 games and was the recipient of the Red Tilson Trophy (OHL Most Outstanding Player), the Eddie Powers Trophy (OHL Most Points) and the Jim Mahon Trophy (OHL Top Scoring Right Winger). Connor Brown then went on to play for the Toronto Marlies during the 2014-15 and 2015-16 seasons where he totaled 90 points in 110 games before being called up to the Maple Leafs. Now in the midst of his third NHL season, Brown has recorded 90 points in 216 regular season games with the Maple Leafs.